I started my trek designing, developing, and managing social / collaboration platforms in 1996. Over those years I've been part of a lot of different projects, development of platforms, long term and short term strategy and planning with vendors in the space, and in recent years back helping design, and product management (from an advisory role and mentoring). I have also been framing product needs and flows for new systems (either plugging into existing social platforms for new major releases, adding these capabilities into existing platforms with distinctly different focus to augment them where other existing services can't fit, and / or building platforms from scratch). I have also been continuing to advising organizations by helping them understand their needs better and problem sets they are trying to resolve before they get into the selection process, so to best fit product to their actual needs. The lessons learned aren't new lessons learned for me, but I'm finding they are still relevant and haven't shifted all that much in the last 7 to 10 years. The build versus buy question is oddly still asked. I had figured about 15 years ago that by 2010 organizations would mostly just consider buying a service or platform to use. 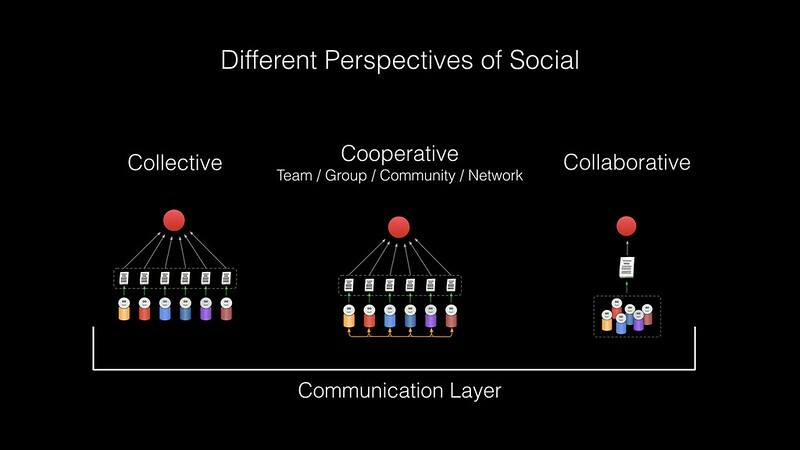 Many organizations still are considering building, as social and collaboration seems easy. But,nearly always you want to buy a service or platform rather than building. Why? Time. This is comparison is for getting things up and running and working smoothly at a somewhat foundational level. On average, after going through needs assessment and right fitting a purchase decision a service or platform can be up and running optimally in around 9 months, with the usual range being 6 to 18 months. That is getting the service running, getting test groups in the service, optimizing and iterating the service, modifying the design and UI to meet needs, building taxonomies that work, getting onboarding created and honed, work through some lasting workflows based on needs, and getting community managers comfortable working with the service and patterns honed for the cultures they are working with. Most services and platforms can be up running and functional in 48 hours for very basic functions, usable in 2 weeks, working through initial groups and integrations in 3 to 6 months, and iterations and scale often span the 3 months to 18 month difference. If you are building your own it is 2 years to 3 years on average to get something up and running and working smoothly. This 2 to 3 years is the comparison to the 9 month mark. Many well funded product development attempts are getting to feature parity with something they could buy in that 2 to 3 year span. There a few reasons to go down the longer and more painful build path: 1) There isn't a product that remotely covers the complexities you are experiencing and have documented in your needs assessment (more than likely a good chunk of what you need to build can be bought); 2) The identity model and adaptive needs aren't supported by existing offerings (this is one of common reasons as identity models with adaptive use on most platforms are limited - most often limited on the free or bundled services - and in many platforms rather stiff and restrictive); 3) You are building or integrating a large collection of services that don't interconnect well and collaboration, social interactions, communication in and around them is essential; 4) The social components are internal to another platform you own and have built end-to-end. There are a few other edge cases to build rather than buy, but these four are the most common of the rare cases where buidling makes sense. If building what is needed? The most important things needed is teams who have done this before a few times (yes not a team as this isn't a light effort). Building social platforms is hard and complex, it isn't adding commenting to content on an existing site, nor building a simple messaging system, but dealing with adaptive systems that will need to embrace and support many cultures and sub-cultures that intersect with their different mental models. See the roles needed in Team Roles Needed for Social Software Projects. If you have those covered, particularly the social sciences, and with people with serious depth on these, not just watched TED Talks, nor read light blog posts, nor the TLDR versions, but actually had years doing this on top of serious depth of understanding, then you may be ready. How Can This Still Be So Lengthy? Social software is hard and complex, which is the simple answer. There is a lot to build and account for. I've watched and worked with teams who have built a few platforms for social and collaboration in the past and sold them off. They have started anew and getting to a good platform with basic feature parity with some new functionality to move things forward it has been 2 years at a minimum. In the past couple of years there have been quite a few new services surfacing that have design and development teams with nearly all members having 5 to 10 years of prior experience building and managing social platforms and in 6 to 9 months they have something decent, yet still a clumsy beta. The product isn't open to everybody. It normally goes through heavy iterations and most of them shut everything off for a few months for rebuilds and reopen beta again. A decently good and useable service and platform often hits that mark at the 2 year point, if not farther out. Another reason it takes time is the adapting to changes and norms of use. Most organizations are looking at systems that will be relatively easy to understand for their employees and or customers so they spend minimal amount of time training and onboarding. The interaction patterns that are common and norms are rather fluid and shift a little or a lot every 9 months to 18 months or so. Patterns that were fine at the product development start, may have changed quite a bit in a year. A few years back I framed out 20 social roles for different interaction model roles people fall into in social platforms / services. When I started talking about it vendors responded that they were lucky if they had two: User and Admin. In the past 6 years things have changed a little for vendors as they are trying to embrace more social roles. But, for community managers they are commonly working with 6 to 12 different roles and or personas, which has vendors working with a broad set of personas, sometimes beyond 15 (the social role is just one element of a persona and it is common in reality to have people with 4 or 6 different social roles they embrace across a few groups in a community or network. Having those designing and developing a platform working from this understandings helps smooth some of the complexity. But, having solid familiarity with this diversity has become essential if building a service or platform that is expected to work broadly, which is what social platforms do. Hopefully this helps a tiny bit when thinking through "should I build or buy" or "why is my social product development taking so long" questions. In 2008, or so, I would have semi-regular calls with a friend who was also doing social and collaboration consulting and advising. Stuart Mader and I would set aside 30 minutes or so to compare notes about our client work (these often lasted 2 to 3 hours). The common trait with our clients was most had purchased tools and services to roll out internal social platforms for their employees. Nearly all of those who came to us had their services and platforms up and running for a while, but at the 6 month to 18 month mark they started to realize all of this work was more than complicated, it was seriously complex. The customers and potential customers weren’t certain they had the right tool or platform for their environment and they needed help to better understand their actual needs, problems, and gaps. This transition from the “social is simple” perception to “this is incredibly complex” Stuart called the “One Year Club”. It was roughly in that one year window that the reality of what they were trying to do sunk in. When we would work with the clients and walk them through foundational questions and framings for the variety of models of social interactions (collective, team / group / community / network, and real collaboration) as well as other essential models (these foundations became my Social Lenses in late 2008, which are now up to 60+ lenses) the understanding and clarity of the state of things for them would become far more clear. Is the One Year Club still relevant? In recent client, potential client, and workshop attendee discussions over this past year the issues that were relevant in 2005 to 2010 that caused the One Year Club moniker to come to life and live on still exist. Nearly every engagement I have where I do either a high-level Lenses framing or a deeper workshop session all get the “we really needed this badly early on when we were trying to understand our problems and set requirements” response. All find something deeply valuable, that is becomes clear in the sessions, they need to focus on. At the same time most realize they may not have the right system for their needs. All find deep value in the sessions because they quickly identify improvements and efficiency gains, from the insights they see through the clarity of the Lenses that help them see through the fog of complexity. Many of these gains are helpful in the short term, but other find quick solutions to keep things going as they work through how to resolve their larger platform change needs. Looking at things in the past year through all the discussions and reviewing the state of many of the platforms (particularly those that are relatively inexpensive, free, or included as a throw-in from vendors selling other products), not only is the One Year Club still valid, but may be broader reaching and in a worse state than the 2005 to 2010 stretch. Why is the State of Things Worse? First off, not everything is the same or worse. Some platforms continue to grow and evolve through maturing in ways that embrace the diversity of how humans are social and diversity patterns of how people work, Jive is one of those. There are also new entrants that have taken things like chat, (in most large organizations with Microsoft foundations Lync (now rebranding as Skype for Business) chat was claimed by many corporate IT departments as the second most used piece of software / service after email in the organization) and added solid functionality (ability to archive by default, including documents and linked objects, and use really good search across it all) and solid ease of integration that in a sense has been making “Slack is the Operating System” a truism for many. Another great asset that is available today is the Community Managers Roundtable that provides insights for managing a community and the skills for running, measuring, and keeping a community vibrant. The trouble that lead to the One Year Club years ago was largely people under-estimating or not doing the needed due diligence. They was also a lack the understanding the regular and continual assessment need for the right fit of their offerings to the problems, needs, and gaps they were hoping to solve. This is often exacerbated by the lack of broadly and deeply framing the problems and potential outcomes up front. I covered some of this in my CMSWire piece “Finding Your Right Collaboration Fit” and a recent talk at 18F titled “Internal Social / Collaboration (Slideshare link)” (an 18F write-up of the talk "Imagining a water cooler for the digital age is also available, with links to a less than optimal quality video of the talk). The basic understanding that tools matter is not only lost, but is often considered not relevant, until an organization gets to the point of needing core features and functionality that come with a maturing community (or other scaled classes - teams / groups / networks). They also find the platform they are on not only doesn’t provide those, but can’t be adapted as the foundation for the platform isn’t structured to handle mature needs. This all can be headed off up front though the use of Lenses to not only see the current state of things, but use of quick scenarios for what things will look like in one to three years as things scale and other potential realities come into relevance. Another thing that makes today’s state of things more troublesome is the common existence of more than one platform being successfully used in organizations. With the onset of new services there is much more to think through, to potentially work into the fold. The new services can be targeted at niche areas that fit various workflows and mental models really well at a good price, or offer a drastically improved set of functionality or class of service (like chat), where it is bordering on a new class type. The One Year Club often considers shifting all of their team and group services from a platform that functions okay, to a chat service, rather than thinking about integrating and how that would work in their distinct environment. The One Year Club continually is considering jumping from one platform to another, which is not only not fungible, but of a completely different category / class of service. Often their core platform may not serve their needs, but is of a class or category where they have a need, but they also have other needs to be addressed as well. It not only can get better, it must get better. The path to getting better is to understand and embrace complexity as a reality, as well as embrace adaption. One must also learn to see through the fog of complexity to more clearly see the problems, needs, and gaps as well as see the small pieces clearly with lenses so to overlay lenses to see the intersecting influences at work. This not only helps understand today’s needs and the short term, but helps with working through near future scenarios (one to three years, occasionally five year views) so to understand the shifts that may happen so we can make considered choices today, while also having adaptive solutions ready for the impending changes and shifts. This changes the state of things being seen from disruption (otherwise known as having little clue what is happening and not being prepared) to relatively easy adaption through understanding and being comfortable with change. I have long been a fan of design fiction to frame what the deployment of a design idea looks like after it has been created and is in use. I have used this quite a few times in my own work over the years. But, seeing great examples of design fiction in public isn’t a common occurrence. The great folks at Near Future Laboratory do great design fiction work – it is well worth picking up their “All-In-One Design Fiction Combo Pack” if you haven’t yet. This week Union released When A Branch Becomes The Root: A proposal by UNION that imagines the future of NYC’s branch libraries.. This is not only a great example of design fiction, but a great rework and imagining explained as happened of how to reshape and design not only the physical New York City branch libraries properties, but how to expand how they function as a service for people in the city. The brand / identity design becomes as much of an important part of the work as it helps not only help the library stand out, but helps bring the library and information out of the libraries and into people lived. There is so much that is really good in this proposal and how it is executed that it will likely be an open tab for a while in my browser or in near reach saved out.